Please visit here for details on SAVINGS! "Frank, you did it again. 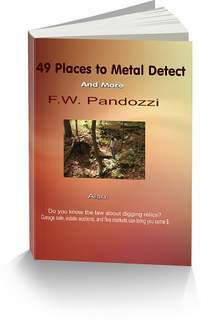 49 Places to Metal Detect: And More, is another one of your ebook winners. It’s brief and concise, yet packed with information I had not known. And I’ve been metal detecting for 30 plus years. My ebook “49 Places to Metal Detect: And More”, is going to pay for itself. If you don’t find in coins, at least what you’ve paid for the price of this ebook, well…that’s because you’re not following the advice that I put into it. “This ebook has more than paid for itself. I liked it so much Frank, I’m buying your other ebooks also. Are you interested in some tips on how to increase your finds? “Those tips you give in your ebook helped me to find items at sites I thought I hunted out. Frank, I went back to 3 areas, used your ideas and found 4 coins, 2 were silver, and a ring. The ring was an old, brass wedding band. I was shocked when I found these. I really thought I pulled everything from those places. My ebook, “49 Places to Metal Detect, And More is just $2.99. Use the secure button below to purchase. After your purchase you’ll be prompted to download the ebook. And be sure to visit this page for more listings of my ebooks. This book is not a hard cover, it is not a softcover, it is a digital download. Visit here for more of my ebooks!